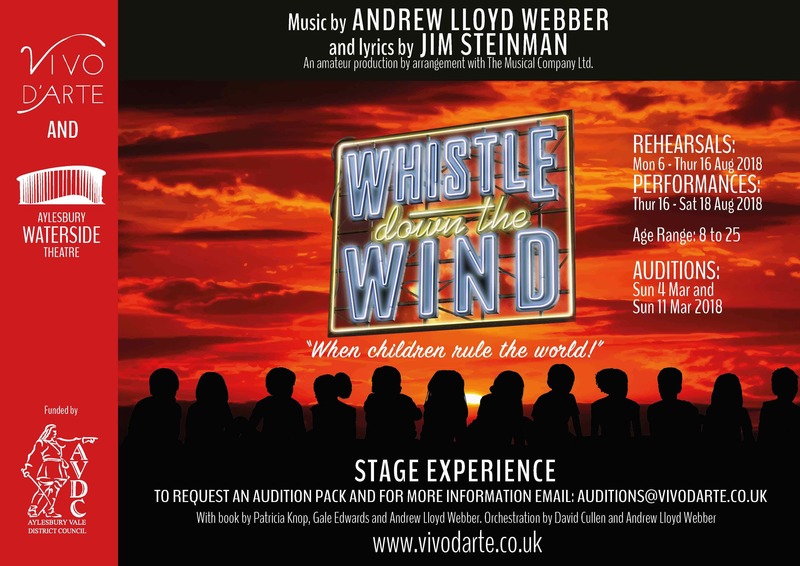 Following the resounding success of Vivo D’Arte and Aylesbury Waterside Theatre’s first ever collaborative Stage Experience project this summer, both are delighted to announce the project will return with a production of Whistle Down the Wind. Funded by Aylesbury Vale District Council, local young performers aged 8 – 25 years will once again be invited to audition for a part in the summer production. Intensive rehearsals will begin in August 2018 culminating in performances from Thu 16 to Sat 18 August taking place in the Aylesbury Waterside Theatre Main Auditorium. Whistle Down The Wind by Andrew Lloyd Webber and Jim Steinman is based on the book of the same title by Mary Hayley Bell, and was later produced as a movie in the hands of Richard Attenborough. The musical is set in a small, deeply religious town in Louisiana of the 1950s. A poor farming family led by father, Boone, and his three children, Swallow, Brat, and Poor Baby, have recently buried their mother and they are still struggling with the grief. As Christmas approaches and the family cannot afford any presents or luxuries, the three children are desperate to find something to hold on to and believe in. One day, they find a stranger injured and hiding in their run-down barn. or register for the information pack by clicking here. Read what our audiences and cast thought about Oliver! Stage Experience 2017 clicking here. Read our survey results following Oliver! Stage Experience 2017 clicking here.